Come January it will be Rob, Amanda and our sweet baby girl !!! We were hoping that last week we'd get an answer but it did not go as expected... I had had nothing but water for 4 days and I downed a Mountain Dew 30 minutes before our appointment to try and get our little bit hopping. We get there and surprise surprise there he/she sits cross legged with the cord between their legs. The technician tried for 30 minutes to get her to flip and show us... but like a stubborn little lady she stayed put. Needless to say we were just a wee bit bummed. Yesterday we got to see little bit at the doctor. Of course he couldn't get a clear look either. He said he thought it was highly likely we'd created a boy. But he could not say with much certainty. Today we went back to the prenatal imaging place and about 5 minutes into it.. the technician says "I'm certain it is a girl". She was flipped on her head showing off this time. SO once she got a clear look, she showed us why she was saying that... and wabam... silence. It was like crickets. Regardless we did our first round of shopping. We've picked out a name. And we are adjusting to calling our sweet baby G our little girl. It's weird... it's scary... it's exciting! "Let her sleep... for when she wakes... she will move mountains." P.S. I promise to return not just when I have baby news to share. I don't want my blog to turn into a baby blog. Not that it really had a purpose before.... but ya get my jist. Yea!!!!! That's soooo exciting!!!! Little girls are awesome!! Congrats!!!! We wanted a baby boy so bad with our first that when the tech said girl, I almost cried. But after awhile the idea grew on us and we wouldn't have it any other way! Congrats!! Little girls are AWESOME!! I couldn't imagine life if my daughter was a boy! I'm so excited for you! Congratulations on your baby girl! Congratulations! That is soooo exciting! That's always how it goes, right? My middle brother was supposed to be a girl (crappy ultrasound back in the 70's showed him to be a girl) and after the birth...whammo! Time for a new name. At least the baby doesn't care what color their clothes are, or nursery. And you can masculinize and feminize almost any name. 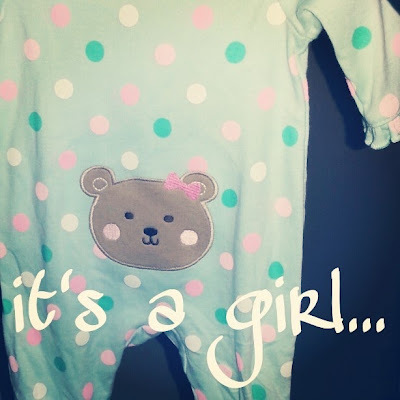 But congrats- clearly, she's gonna be a sweet handful, and hopefully healthy as an ox. Yay! Congrats! Girls are so much fun to dress up!